SRG’s shielded enclosure is a time-proven design that still has original models in existence and performing as well as they day they were constructed. Perfect for both medical and industrial applications, modular panels mean that enclosures can be built to almost any dimensional configuration. SRG will create the enclosure to any dimension provided by the client, or we can custom design upon request. The core principal of our shielded enclosures is a three-quarter inch thick dimensionally stable core, which is laminated on both sides with optional gauge sheet steel or copper sizes, contact for sizing, (Cores meet ANSI A208.1 specifications). The steel lining is excellent for reflecting and attenuating EMI/RFI signals, providing the best attenuation to magnetic and electric fields, and plane waves. Panels are joined together with a one-eighth-inch “hat & flat” clamping system. No special tools are required for construction. Enclosures can be erected, adjustments can be made on site if needed, dismantled, and moved to another location as needed. Enclosures are self-standing and require no attachment to the permanent building structure. SRG’s enclosures are guaranteed against defective materials and workmanship and to retain the specified RF shielded characteristics for a period of one year. 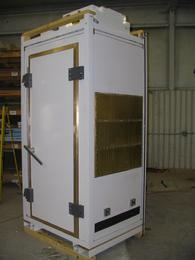 SRG manufactures "Portable Enclosures" designed to meet our clients requirements and specifications. 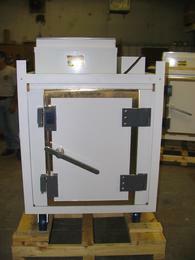 These custom built enclosures can be table top or roll around units and fitted with anechoic material if required. SRG has designed enclosures that are being used for R&D, Quality Control, Pre-compliance testing, Personal communication device testing, EMP protection and even video projection cabinets. If you cannot find an "off the shelf" enclosure (from one of our competitors) to suit your needs, you can only benefit by contacting SRG!